Crochet? Knit? Needlepoint? Argue with the wife? That’s for the birds! Birds! Did I say birds? This is when a couple of red-beaked “love birds,” otherwise known as Sylvia and Elmo, came into my life. It’s been five months now. “Bird brain” has taken on new meanings. Put a milk carton into their cage. Within a short time the birds will have removed the plastic spout, will have removed enough of the lid so each can slip inside for a warm tête-à-tête. How did they figure that out? Put an empty cereal box into the cage. You’ll think there’s a woodpecker nearby. No, it’s only Sylvia tap-tapping, perhaps to determine if the box is hollow? Then she’ll make an entry-exit hole for her pleasure. Sylvia appears to rule the roost. She wears the feathers in the family. Listen carefully, and you’ll hear her telling Elmo a thing or three. Later in the day … silence. Observe. They are snuggling together on their swing or on a branch. Eyes closed, each softly serenading the other. Soon there will be more fun … a paper-towel tube held horizontally within the cage by a branch keeps Elmo busy as he works diligently at removing the outer skin of the tube. He’ll figure out how to crawl into the tube, push his way through to the other end, exit, then waddle to the entry and repeat the process to his and his mate’s delight. Sylvia, in the meantime, has been busy disassembling the cereal box, working her beak like a very old-fashioned can opener. Other times she’ll open a hole at the top of a cereal box (the box is on end), she’ll slip through her opening to the bottom and figure out how to claw her way back up and out of the box! Listen carefully as she squawks, “Surprise!” A branch from a bush with a multitude of tooth-pick like twigs will amuse for days. Within minutes the birds will, with malice aforethought, begin removing all the twigs and then proceed with the thicker stuff. T I M B E R ! As the days click by I am questioning and thinking about other distractions with which the love birds might keep ME occupied. When bored they’ll mark time making spit balls, or running snips of paper through their beak like they are playing a harmonica … a longer snip will initiate a game of keep-away. Elmo will dip a snippet of paper into the water and massage it. As a child did you ever massage a wet wash-cloth between your teeth? Why? Any relationship? 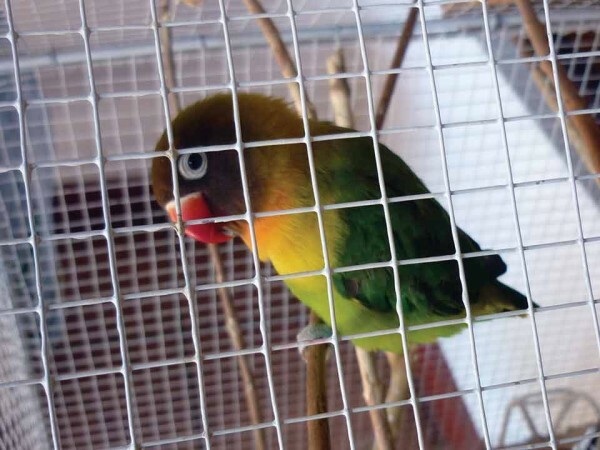 A mirror at the cage will fascinate as they search out how to meet up with the birds behind the glass. Listen to them having a four-way conversation. Ah, our son experimented with his iPad. Even birds will listen, talk back and sing along. Odd-shaped boxes. They too are for the birds. Sylvia will punch a hole into one end of a long box. Both birds will look into the black interior and actually chat about the situation. “What’s inside?” “Is it safe?” Eventually she’ll pop another hole at the other end. More light? After some time she will enter with caution. Elmo, never. You’ll conclude after some observation and assessment that Elmo’s timid, shy, maybe fearful. Sylvia decided to take mandarin seeds from between my fingers after a short time. Elmo, however, took more than two months before he’d risk it. She’s happy to mistake my skin for a seed. Yes, Sylvia’s one tough cookie. In lieu of the two or three hours I’d spend painting, I find myself fussing with the birds and wondering what might be added to their home to amuse the four of us since the Frau has determined observing and talking with the birds can enhance marital relationships. Oh yeah, I’ve found that the love birds don’t mumble like we do, nor do they whistle. But, they’ll hold a conversation, with eye contact, for as long as you are willing. The expression “it’s for the birds” has definitely taken on an entirely new meaning.